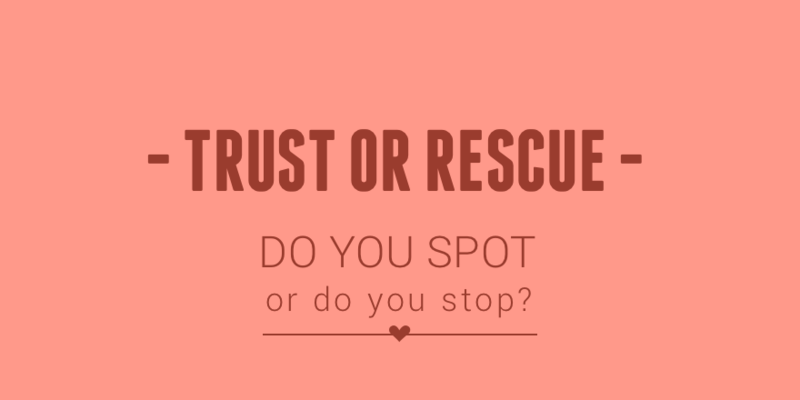 Trust or rescue? - do you 'spot' them or 'stop' them? Parenting with the heart in mind is about kindness, and treating our children as people. It means putting ourselves in our child's shoes by remembering what it felt like to walk through our own childhood. Getting in touch with those emotions and needs helps us to respond in loving ways. Sometimes the gentleness involved is misinterpreted as meaning ‘smothering’, doing everything for your child, and smoothing the way so they don't encounter bumps along life's roads. Most often the misinterpretation is a judgment from others, rather than fact, but it is worth looking at how we can parent gently without unnecessary ‘rescuing’. Parenting is very often walking a line between two things - freedom and limits, independence and nurturing, or in this example, protecting your child, and trusting them to solve for themselves. It's easy to let the balance fall too heavily either way, and so we need to stay tuned in to our child, noticing where things are for them, and in our relationship. Spot them, rather than Stop them. When it comes to risk taking, children are often very adept at knowing their capabilities. Taking their lead is often the best approach, and so we can be there to ‘spot them’, rather than stop them. They develop in confidence and competence through their own efforts. They need us to trust them, and allow them to challenge themselves. This is different than us being complacent. There is risk and then there is danger. We don't show trust by letting young children cross a road alone, but to climb a ladder, balance on a log, or find their way out of a tree? We absolutely can. What we come to learn is that giving help, or giving support are different in their approach, and in their outcome. For example, at the park, a child who has climbed up a ladder themselves can judge how far up they are and are better placed to navigate their own way down safely. If, instead, they are ‘helped’ with a lift up, their understanding of height is distorted. This can result in either overconfidence and an unsafe dismount, or under-confidence in their own abilities, and a reliance on adults for more help and a lift down again. For an infant, a ball rolling under a chair but within reach, support is allowing the infant to work it out, and offering words if needed to encourage, but help would be retrieving the ball for them. Supporting an older child with a friendship dispute is listening, empathising, and discussing for some resolution ideas, helping could be apologising on your child's behalf and sweeping over any issues with an extravagant play date to mend the friendship. When we rescue our children, we make it hard for them to develop their skills, and to experience challenge our frustration. What we want to show them is we trust them to try, to manage, to cope, and to solve. This doesn’t mean we just ‘leave them to it’. Our active involvement can be us observing, and taking their lead, waiting to be asked before taking any action - doing less, and letting them grow far more.